*** Price of Protecting The Nation: Who is the Real Enemy? It is past midnight, the company commander is out in an ambush expecting an infiltrating column of terrorists from across the line of control, hands and feet are frozen but not the spirit. He occasionally checks with surveillance team if TI sight is picking up any image or movement of terrorists. In between he checks with his base if all OK at the base. The standby reserve column in the post is ready to move at zero warning; sentries in the camp are looking for some unusual sound and barking of dogs. It is no secret that commanders do not sleep for more than three to four hours in a cycle of 24 hours. The physical and mental stress level is very high and in such an environment they have to perform and deliver. In the meantime the commanding officer calls up the post and informs that intercept has been received that terrorists (suicidal) are likely to strike some post. The brigade operations room is active, commander and his staff is monitoring the encounter going on in another battalion area. Reinforcements are required to be moved and a casualty has occurred that need urgent evacuation. In military hospital lifesaving surgery is going on and the time is 0300 h in the morning. Divisional Commander is woken up by his staff informing him a major encounter taking place in one of the sector and movement has been detected in another area. Movement of Pakistan regulars noticed close to LOC and may be attempting border action against a forward post along the LOC. Special forces team in base is asked to mobilise to be heli-lifted before the first light to deal with the terrorists holed up in a built up area with hostage still stuck inside. It has taken exactly a quarter of a century, but the most enduring fallout of the terrorist attack in Uri and its aftermath may be that relations between India and the United States of America have come of age. Hardly anyone remembers now that the idea of New Delhi and Washington being "natural allies" was coined by India's army chief, General S.F. Rodrigues, in 1991 when he received Major General Claude M. Kicklighter, commander-in-chief of the US Pacific Command, in New Delhi as Kicklighter came bearing proposals for military-to-military cooperation between the two countries following the end of the Cold War. In the popular imagination, the idea of an Indo-US natural alliance is attributed to Atal Bihari Vajpayee in 2000, when the Bharatiya Janata Party's first prime minister played host to Bill Clinton during the first American presidential visit to India in 22 years. That is mostly because the Kicklighter proposals, which prompted Rodrigues to coin that memorable phrase by and large remained what they were: proposals on paper. Indo-US relations needed a lot more of very patient work to even move towards any relevance. During the screening of the biopic on Indian cricketer Mahendra Singh Dhoni, which released on September 30th of this year, we were made to stand up for the National Anthem. It made me wonder was it just a normal screening or was it the result of sudden attitudinal obsessions with anti Pakistan sentiments post the Pathankot and the Uri Terrorist attacks. Speculative news reporting is leading us to a dead end. Whether there is going to be a war, whether Pakistan will be isolated, whether Pakistan will be declared a terrorist state are all conjectural stands. News stories and reporting these days are skewed towards sensationalism and amidst all this the Pakistani establishment remains shamelessly impervious to the pressures by international political order, boasting of its nuclear strength etc. Pakistan our traditional adversary can be handled only through diplomatic pressures. Indian institutional mechanisms need to be restructured, remodelled, and reequipped in this era of asymmetric threats and changing battlefields. The digital platform is flooded with memes telling India what it should and should not so. British Prime Minister Thatcher had once said by giving publicity to troublemakers through the media we are making them more powerful. The war game in realpolitick is really dirty. It seems like actor Fawad Khan and singer Ali Zafar either wear a uniform with Pakistani state insignia on their shoulder badges or they are one of those unshaven Lashkar–e Toiba’s chief operatives and not artists. At least this is what the media is trying to tell us, or project them as. Indian diplomacy went haywire back in 1947, when Jawaharlal Nehru who had no idea about military strategy, war games and diplomatic policies was made the first prime minister of a newly independent and partitioned India. Diplomacy essentially is a process by which a state negotiates with another, putting national sovereignty, security and territorial integrity on top of the agenda. Let’s take a look at the cultural isolation and “Aman ki Asha” (Desire for peace) moves which India has crafted time and again to improve its ties with Pakistan. Budge not says the Pakistani devil, budge says the Indian Angel. The situation our current leaders are in is no less than that of Launcelot gobo, Shakespeare comic character who could not decide on what he wanted to do with life. Does India lack curiosity that questions or may question Pakistani motives? Can we declare war on a nation just on the basis of intuition and instinct? The recent inaugural Indian Ocean Conference (IOC 2016) while well-timed and successful in projecting India’s soft power, failed to come up with concrete recommendations to re-energise trade within the region. This should be a key focus of IOC 2017. The recent India-led inaugural Indian Ocean Conference (IOC 2016) held in Singapore on 1-2 September was well-timed – just when mistrust of China has increased in the region because of its actions in the South China Sea. It was also successful in projecting India’s soft power in the East Asian region. However, although an entire session was devoted to “commerce” (international trade and investment issues), the Conference failed to come up with concrete recommendations to re-energise trade integration among the 21-member Indian Ocean Rim Association (IORA). This should be a key focus of IOC 2017 to be held in Sri Lanka. As is well-known, in the bygone era the Indian Ocean was an active thoroughfare of commercial and religious traffic. Subsequently during the colonial period, trade on the Indian Ocean was fragmented. Presently, intra-regional trade among the IORA members is about 25 per cent of their total trade. But a large chunk of this is trade between ASEAN and Australia: Trade among other IORA members is relatively low. How can intra-regional trade among IORA members be re-energised? India’s Look East Policy (LEP) was initiated by Prime Minister Narasimha Rao in the early 1990s as part of the country’s economic reform package. The objective of the Look East Policy was to promote India’s economic linkages with the 10-member ASEAN. The policy was successful. India’s trade with ASEAN has surged and the country participates actively in various fora initiated by ASEAN such as the ASEAN Regional Forum, and the East Asia Summit. India also holds summit-level dialogues with ASEAN. The 8th BRICS Summit is being hosted by India in Goa on October 15-16 2016 ordinarily would have passed off as an eventful diplomatic event, but it now takes place against a soured background due to adverse strategic postures against India by its member-nations in2016. The Pak-based terrorist attack on the Indian army camp in Uri on September 18, which killed 19 Indian soldiers, has hit a raw nerve in India. This audacious, well planned attack across the LOC (Line of Control) received global condemnation, including from unlikely countries like China, Saudi Arabia and the UAE. Although most of the countries did not name Pakistan directly, the wording of the statements left no doubt as to what was meant. Coming soon after Prime Minister Modi’s charge of terrorism against Pakistan at the recently concluded G-20 and ASEAN summits earlier in the month, shielding Islamabad was out of the question for anyone. Washington impressed upon Pakistan to rein in terrorists of all hues in the country, without the classification of “good terrorists” and “bad terrorists”. President Barack Obama declined to meet Prime Minister Nawaz Sharif on the sidelines of the UN General Assembly despite Pakistani request. But Pakistan is so used to getting snubbed that it would have not mattered much to the GKQ Khakis in Rawalpindi, who really run Pakistan. A cause for worry for the international community is the change in tactics by Pakistani terrorists, who are known as Pakistan’s assets even by their own admission. It now seems that Pak terrorists are hitting Indian military targets. The first attack was on the Indian air force base in Pathankot in January, followed by the one in Uri. The question is whether Pakistan is trying to provoke a war with India. Even if they think that they can dare India and get away with it, patience in India is wearing thin and the government in New Delhi is under intense public pressure to act. Pakistan’s periodic muscle flexing with its nuclear weapons including tactical nuclear warheads ranged against India, does disturb the neighbourhood and the international community. Nobody wants a war, except, perhaps some stupid hawks in Pakistan. As succinctly put by Pakistani strategic commentator and author of “Military Inc.,” Ayesha Siddiqi, the earlier mantra of the Pakistani army was “Allah, America Army”. After the USA started tightening its purse strings and pressed Pakistan to go after the Afghan Taliban and the Haqqani network (HQN), their new mantra is “China, COAS, Cashmere”. But things are not that simple. The ‘Aqua Bomb’ is truly India’s most powerful weapon against Pakistan. As the upper riparian state, India can control the flow of the seven rivers that flow into the Indus Basin. And yet, in the last 69 years, only once has it exercised this great power – and not very well. On 1 April, 1948, with India and Pakistan battling for control of Jammu & Kashmir, engineers in Indian Punjab shut off water supplies from the Ferozepur headworks to the Depalpur Canal and Lahore. Around 8 per cent of the cultivable command area in Pakistan was impacted during the critical kharif sowing season. The city of Lahore was deprived of the main sources of municipal water, and the supply of electricity from the Mandi hydroelectric scheme was also cut off. Water rationing was introduced in Pakistan’s second largest city. When India had its foot on Pakistan’s parched throat, when a little more pressure would have forced Islamabad to behave, and when Indian soldiers were fighting – and dying – to liberate Indian territory, Prime Minister Jawaharlal Nehru committed his first Himalayan blunder by relaxing India’s chokehold on Pakistan. The Indian Army’s strike across the Line of Control (LoC) into Pakistan Occupied Kashmir (PoK) on 28 September 2016 is top news in electronic and print media not only in India but across the world at large. That the strike was surgical, destroyed terrorist camps and caused a large number of casualties to terrorists, their handlers, guides and some Pakistani soldiers is a fact and no one can overlook it; except of course the Pakistani army and its government that continues to remain in denial. My intention is not to reiterate the details of the operation that are by now common knowledge, but I would like to use this opportunity to discuss the unique features of this operation, its likely outcomes and what is in store in the immediate future. The foremost uniqueness of this military operation is that the Indian Army physically crossed the Line of Control and struck at the terrorist camps and their launch pads for the very first time, ever since the proxy war was started by Pakistan in 1989. There have been tactical operations that were conducted in the vicinity of the LoC but these were at a rather small scale and were never spoken of openly. Yes, it has taken the nation 26 years to cross the Rubicon and that is the next significant feature of this operation. It is the emergence of ‘National Will’. 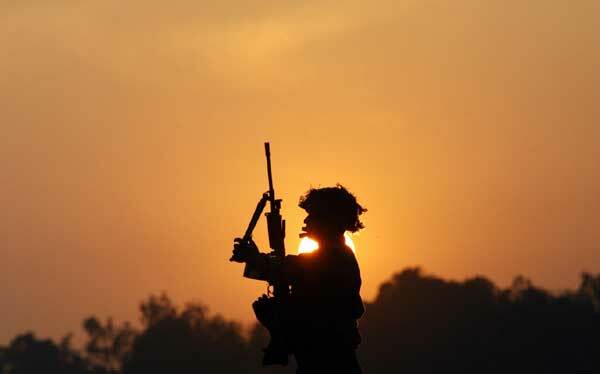 It is not that the Indian Army was not prepared or not inclined to cross the LoC to target the terrorists, it was restraint of the highest order that the country and its political leaders chose to opt for. Today however, the national leadership under Prime Minister Modi has finally taken a supremely important step towards unilateral action against the terrorists in their camps that were under Pakistan Army’s protection. Price of Protecting The Nation: Who is the Real Enemy? What India’s ‘surgical strike’ in PoK has done is that it has changed the rules of engagement in the ongoing proxy war waged by Pakistan on India since the last three decades. It was Pakistan, which had been calibrating this war, and India reacted tentatively but never in a convincing manner. The absence of conviction was due to lack of complete understanding of this new sub-conventional form of warfare, despite the fact that this kind of warfare was found to be intrinsic to Pakistan in all engagements, i.e. in 1947, 1965, 1971 and during Kargil conflict. This jihadi proxy war was honed by Pakistan’s military-intelligence complex to great refinement during the so-called Islamic war against Soviet forces in Afghanistan. The events following the Uri terrorist attacks have witnessed many diplomatic maneuverings by both India and Pakistan at the United Nations that continued at other International forums too and are still on. However, the emerging opinion points to the fact that the conventional superiority notwithstanding, India should not engage militarily with Pakistan beyond destroying the PoK based terrorist camps. The post surgical strike, the Indian strategic planning has to move on to a new turf, an all out diplomatic offensives and a complete destruction of terror support system within the country. The advantage of ‘escalation dominance’ seemed to have rested with Pakistan so much as that it would scare the world of a nuclear holocaust in the Indian subcontinent in the event of any military action across the LoC. However, that perception has now been broken after the surgical strikes on PoK’s terrorist launch pads on 28th Sept 2016 night. India later unilaterally announced that its purpose of neutralizing terrorists has been met and it does not want any further escalation and rather called upon Pakistan to join the fight against the terrorism in this part of the world. As a responsible democracy, India would not risk its reputation by going against the generally prevalent opinion of war not being an option to settle the bilateral issues between India and Pakistan. India and Pakistan shouldn’t gamble with nuclear war. Kashmir has again become the venue for a confrontation between India and Pakistan. On September 11, militants attacked an Indian military post in Poonch, and on September 18, another in Uri—both towns in Indian Kashmir. They infiltrated the so-called Line of Control (LOC), which separates the India- and Pakistan-administered portions of Kashmir and has served as the de facto boundary since the armistice that ended the 1947–48 war between India and Pakistan. An Indian policeman was killed in the Poonch attack. In Uri, eighteen soldiers were killed (another died later while being treated for injuries) before the assault was repelled and the intruders shot dead. India insisted that in both instances the perpetrators were armed and trained by Pakistan, as its Director General for Military Operations added that twenty similar incursions had been thwarted so far this year. Facing calls for a tough response, Prime Minister Narendra Modi ordered “surgical strikes” against targets on Pakistan’s side of the LOC. Pakistani officials claimed that no such Indian retaliation had occurred. Yet theyacknowledged that two of their soldiers had been killed by Indian gunfire. On the nonmilitary front, there have been the usual back-and-forth volleys of irate words and gestures. Pakistani theaters have stopped showing Bollywood movies, and Pakistan’s Electronic Media Regulatory Authority announced plans to block Indian television transmissions. In India, there was widespread outrage against Pakistan post the Uri attack. The entire nation is looking for drastic retaliatory action and there was tremendous pressure of the government to act. In simple words – the people are baying for blood. The Indian Army has, in an unprecedented tactical manoeuvre, conducted trans-LOC raids on multiple launch pads harbouring terrorists poised to infiltrate into Indian territory. A cross border raid, by itself, is not an unusual military operation; it has been a part of military training manuals across the world since times immemorial. What is unprecedented, in this particular instance, is the political will that has allowed such an operation to be conducted. It has given to the Indian Army the leverage to resort to offensive defence which every professional soldier considers to be more suitable. The Indian Army was unaffected by the media rhetoric then as it remains unaffected now. For the army this is part of the day’s work to counter evil designs of an unscrupulous enemy, even as absorbing the immoral Uri attack with resilience was part of its superior training. . When seen outside the prism of media sensationalism, the operation was righteous in context and professionally conducted. The righteousness for the attack emerges from the fact that it did not target any military installation of Pakistan and thus did not break the 2004 ceasefire pact. Professionalism is evident from the precision with which it was conducted and the manner in which it was kept limited within the ambit of the political direction. This is a true example of the example of synchronisation of the military aim with the political objective and it bodes well for the country. Taliban fighters mounted a coordinated assault on the northern city of Kunduz overnight, attacking from four directions and entering urban areas and threatening a repeat of the operation in which they seized the city exactly a year ago. Sheer Ali Kamawal, commander of the 808 Tandar police zone in Kunduz, said the attack began at around midnight (1930 GMT Sunday) and fighting was still going on in and around the city. Some Taliban fighters had entrenched themselves in residents’ houses. Military helicopters flew overhead and gunfire could be heard in Kunduz, where Afghan troops backed by American air strikes and special forces were fighting a year ago to the day to drive out insurgents who had raised the Taliban flag in the city center. Police spokesman Mahfozullah Akbari said security forces were preparing an operation to drive out the fighters, who had set up in the Khak Kani area in the southwest of the city. “The Taliban are inside some civilian houses and we have to carry out operations very carefully,” he said. A statement from the interior ministry said reinforcements were being sent to the city. Monday’s attack, a day before the start of a major donor conference in Brussels, underlines the precarious security situation in Afghanistan, where government forces are estimated to have control over no more than two thirds of the country. “A massive operation started on Kunduz capital from four directions early this morning,” Taliban spokesman Zabihullah Mujahid said in his official Twitter account. He said the Nawabad area with four checkpoints had been captured and a number of soldiers had been killed. It was not immediately possible to verify the claim. Will Pakistan dare to push the nuke button? In the early hours of September 18, 2016, an Indian Army infantry base in Uri came under terrorist attack. In one of the most daring attacks yet, four Pakistan-based terrorists entered the base and killed 18 Indian soldiers. The attack took place amid a shift-change and apparently caught the soldiers off guard. Even after the Uri attack, Pakistan has not backed off. How should India respond to this provocation? Will it repeat the past approach of not responding or act with more determination to stop Pakistan from engaging in such actions in the future? The Uri attack is the second major terrorist strike on India this year, the other being the Pathankot attack in January 2016. The Indian leadership may not have an option of not responding this time, especially because of the major casualties. The public patience within India to Pakistan’s terror attacks is waning quickly putting the political leadership under pressure to retaliate. The army leadership appears to be evaluating options and gearing-up to respond. Pakistan too has possibly begun to sense that there might be an Indian response this time around and accordingly military is on alert. Many believe that India not having responded with any effective option in the past has only emboldened Pakistan to not change its policy and carry out more terror attacks. Even after the terrible Mumbai attack in 2008, India only responded by cancelling India-Pakistan talks. Cancelling and restarting the talks a few months later proved to be useless in affecting Pakistan’s thinking about its policies. India not carrying out more forceful options in the past has also created the danger of Pakistan misreading New Delhi’s intentions and options. 'This army has lost Pakistan's territory, ideology, financial and intellectual capital, ruined its institutions, democracy, the respect for its passport and, like it or not, reduced its status to a globally acknowledged university of jihad,' says Shekhar Gupta. IMAGE: Pakistan army chief General Raheel Sharif. 'If its central premise behind justifying its pre-eminence was winning Kashmir,' says Shekhar Gupta, 'it has failed after 70 years of fighting. In fact, today Pakistan has less of Kashmir than it had after the 1948 ceasefire, having lost Siachen and territory in Kargil, Turtuk etc. What's your view on Pakistan's army? Is it a good army, or a bad army, a great army or an evil army? Is it an invincible army or eminently beatable? Is it a Pakistani nationalist army, or just another Islamic lashkar in uniform with nukes? The answer can depend on which side you happen to be on. As an Indian partisan, I can, of course, use all or some of the many positive choices given there, but I will then perhaps have to live in exile somewhere. Or we can be like our prime-time warriors and simply continue to insist that the Pakistani army is exactly as portrayed in Bollywood 'war' movies, our idea of animated commando comics, bumbling, cowardly, easy to roll over and unsoldierly, particularly when faced with a Sunny Deol or even a lesser equivalent like, say Suniel Shetty or Akshay Kumar. A clinical, professional assessment of the Pakistani army, its mind, motivations, track record and ongoing thought processes is, however, the most crucial need for those analysing, debating, and most importantly, guarding the national interest. The essential complication and challenge of dealing with Pakistan is resolving multiple dilemmas: Are Pakistan, the ideological State, and its army the same entity or different? Can you deal with the State (and people) while leaving aside the army, or vice versa? The Taliban have launched yet another major assault on Kunduz. On Monday, Afghanistan President Ashraf Ghani left Kabul to attend the Brussels Summit on Afghanistan, slated to start on October 4. During the two day conference, the Afghan delegation will make its case to the international community for continued financial assistance as it combats a growing Taliban insurgency. Following Ghani’s departure, conflicting news reports have reported the collapse of Nawa district in southern Helmand province, a strategic district located a stone’s throw away from the provincial capital of Lashkar Gah. Reports emanating from the embattled district claim Nawa’s police chief, Ahmadshah Salem, was killed in the fighting, along with Taliban commander Mawlawi Shir Mohammad and 45 other Taliban fighters. Nawa has been under threat over the last couple of months, with the district temporarily collapsing to Taliban militants in August. Taliban militants also launched coordinated attacks on Kunduz city, with local residents reporting that the resurgent militant group had entered areas on the outskirts of the provincial capital. Government officials claim that the Taliban have been pushed back from the city after a series of Afghan air strikes, though residents are stating that several key roads entering into Ali Abad district and the Takhar and Baghlan highways have been closed by the militants. Could Clinton or Trump Change U.S. North Korea Policy? Would either be open to diplomacy? North Korea’s nuclear program and its defiance to the call from the international community to abandon it in the interest of world peace are shaping power equations between countries that were once adversaries. After US President Barack Obama decided to visit Cuba with a view to normalise relations following decades of Cold War enmity and the communist revolution in 1959, now it is the turn of Japan and China to reach out to the island country. In May 2015 Japanese Foreign Minister Fumio Kishida paid a visit to Havana in the first trip by a Japanese official to the island nation. This was followed by the visit of Japanese Prime Minister Abe Shinzo in September 2016, the first ever to that country since the Cuban revolution in the 1950s. Earlier, Natsuo Yamaguchi, leader of the Komeito Party, the ruling party’s junior coalition party, visited Cuba at the invitation of the Cuban Communist Party and delivered letters from Abe to Raul Castro and former President Fidel Castro. Abe’s visit to the Caribbean island is one of a slew by Western leaders since it began normalizing ties with the United States nearly two years ago. U.S. President Barack Obama visited Cuba in March. However, it is unusual for a Western leader to meet Fidel Castro, who usually only sees close allies. What led to this sudden Japanese interest to relook at its ties with this communist country? Japan’s interest in the development of relations with Cuba grew after the US and Cuba resumed diplomatic relations in 2015, which had been severed since 1961 and the subsequent visit of Obama to that country in March 2016. The activation of China’s first desalination plant on Woody Island improves the island’s livability. On Sunday, Chinese state media reported that a new desalination plant had been activated on Woody Island in the South China Sea. Woody Island, known as Yongxing Island in Chinese, is the largest of the Paracel Islands and China’s largest permanent outpost among the disputed features in the South China Sea. Around 1,400 personnel, mostly with the People’s Liberation Army, are positioned on Woody Island, which is also claimed by Vietnam and Taiwan. The activation of a desalination plant on a South China Sea feature is a notable first for China, with potential strategic ramifications. Is China’s Energy Transition Dead in the Water? Despite some promising developments, Beijing continues to struggle to capitalize on renewables and green tech. While sports car manufacturer McLaren has denied rumors that Apple harbors concrete plans to acquire or invest in order to accelerate the Cupertino-based company’s mysterious electric car project, the shift toward developing practical electric cars is clear. And naturally, China is never too far behind. Le Holdings Co. raised $1.08 billion on September 21 to develop its own “Tesla killer” car, ahead of new rules put forward by the Communist Party of China that aim to increase technology standards, while also reducing the number of manufacturers to ten in order to tackle overcapacity. However, is this a good play by China or is it just another vanity project of the Central Committee to boast Chinese engineering? To begin with, while the science behind electric cars is sound – their emissions are, on average, 50 percent less than a conventional car’s – the fact that China still generates 69 percent of its electricity from coal offsets the progress being made in consumer carbon footprints. Indeed, as Bloomberg pointed out, “Running on battery power in China was just 15 percent cleaner than a fossil-fuel car last year.” With so much attention given to ensuring the competitiveness of its dirty industries (such as coal or aluminium), it’s no surprise that China’s patchy EV infrastructure has been lagging behind other markets. Could Rising China Make the World More Stable? As China grows in influence, it could help bring more coherence to the exiting world system. The rise of great powers can hardly be said to be a smooth process. As China gains more clout, recent conflicts and disputes over certain Chinese policies and actions can be viewed as perhaps inevitable concerns or even impetuousness from its neighbors, and especially from the dominant United States. Thus, China’s rise naturally will have to be a long-term and complex journey. What exactly helps to realize and safeguard ultimate success and lasting peace for a rising great power? The formula surely includes both comprehensive national power and a dominant international system that is based on the prevailing values, rules, and institutions. The question is: what exactly is this system, and what impact will China’s rise have upon it? In Immanuel Wallerstein’s view, the modern world economic system that began with the commencement and development of capitalism in Europe in the 16th century. How have the nation states been bonded together in the development of modern and contemporary international relations? I suggest that there have been several “sub-systems” or practical mechanisms since the Westphalian era to define and regulate international relations in Wallerstein’s world system. Nation states and the later dominant nations in the world system have designed and practiced international relations through different mechanisms or “paradigms” under the dome of Wallerstein’s world system. We may describe these mechanisms make up “paradigmatic systems,” which includes the “treaty system” originated in Europe, the global “colonial system” particularly under the control of Great Britain, and the “alliance system” in contemporary world politics under U.S. leadership. These “paradigmatic systems,” in different historical periods, have regulated international relations, influenced politics among nations, and also shaped their mutual epistemic recognitions. How Large Is Israel’s Nuclear Arsenal? Former Secretary of State Colin Powell’s recently disclosed estimate that Israelowns 200 nuclear weapons has triggered new interest in the Jewish state’s ultimate war plan. But experts believe Mr. Powell’s warhead count is too high. Israel’s focus on using such devastating weapons has waned amid the new geopolitical map of neighbors Syria, Iran, Iraq and Libya. The Washington Times reported in 2004 about a secret Defense Intelligence Agency assessment that said Israel owned 60 to 80 nuclear warheads and would have about the same number by 2020. The Washington Post recently said the DIAleak remains the only official U.S. government count that has ever surfaced publicly. Mr. Powell provided his 200 figure in 2015 in a private email exchange that was disclosed by the hacking group DCleaks.com. He was discussing the unlikely event that Iran would ever attack Israel given its nuclear-capable counterattack. Hans M. Kristensen, a nuclear weapons expert at the Federation of American Scientists, said he believes the DIA number has survived the test of time. In 2014 Mr. Kristensen and a colleague wrote in the Bulletin of the Atomic Scientists: “We conclude that many of the public claims about the size of the Israeli nuclear arsenal are exaggerated. We estimate that Israel has a stockpile of approximately 80 nuclear warheads for delivery by two dozen missiles, a couple of squadrons of aircraft, and perhaps a small number of sea-launched cruise missiles. In September, the Crystal Serenity cruise ship – bound from Anchorage to New York – completed its historic voyage through the Northwest Passage along Canada's northern rim. This journey made headlines because it is the first tourist vessel to traverse the Arctic route that has claimed the lives of several and imperiled dozens of other adventurers. This voyage was enabled by record breaking sea ice melt in the Arctic Ocean. Ocean access during summertime, generally speaking, has been increasing since the 1970s, both with respect to area of open water and duration of melt each year. However, this voyage was made possible by Crystal Cruises' meticulous safety preparation that can fall back on the U.S. and Canadian search and rescue (SAR) systems. In the event that the U.S. SAR system would have to be tested, what is there to fall back on? Actually, a surprising amount. The Coast Guard maintains a seasonal presence in the Arctic, with one cutter and two helicopters stationed north of the Arctic Circle. Also in the Arctic, the North Slope Borough SAR, a highly capable Native Alaskan organization based in Barrow, and commercial entities like Crowley Marine can provide assets, personnel, and regional expertise. Farther to the south, the high prevalence of Department of Defense assets in Alaska can be requested to augment capability, including the Combat Search and Rescue specialists within the Alaska Air National Guard. Lastly, international SAR support from Canada, Russia, or Denmark can further strengthen response capabilities. "The Navy will avoid using the term A2AD as a stand-alone acronym that can mean many things to different people or almost anything to anyone." I've learned a great deal in my first year as CNO, and I've re-learned a few important things too. One thing that’s been made clear is the timeless importance of clear-thinking and clear communication. A current example of this point, and one that is often mentioned, is the term “A2AD”. To some, A2AD is a code-word, suggesting an impenetrable “keep-out zone” that forces can enter only at extreme peril to themselves. To others, A2AD refers to a family of technologies. To still others, a strategy. In sum, A2AD is a term bandied about freely, with no precise definition, that sends a variety of vague or conflicting signals, depending on the context in which it is either transmitted or received. For the Navy, everything must be appreciated through the crystal clear lens of enhancing our ability to conduct our mission. As discussed in A Design for Maintaining Maritime Superiority, the U.S. Navy will operate at sea and be ready to conduct prompt and sustained combat to protect America from attack and to ensure the nation can project strategic influence around the globe wherever and whenever necessary in support of our national security aims. To ensure clarity in our thinking and precision in our communications, the Navy will avoid using the term A2AD as a stand-alone acronym that can mean many things to different people or almost anything to anyone. We have to be better than that. I advocate this approach for four reasons. The Russians might not be willing to back down in a confrontation with American forces. Tensions between Russia and the United States are coming to a head over the civil war in Syria. Washington has suspended bilateral talks with Russia to end the five-year old war. Moscow has suspended an agreement to destroy 34 tons of weapons-grade plutonium that was reached during the year 2000, using especially harsh rhetoric. Meanwhile, Syrian regime forces—with the backing of Russian airpower—are continuing to mount a fierce attack on the partially rebel-held city of Aleppo with Washington seemingly powerless to influence events on the ground. As a result of the recent collapse of a ceasefire negotiated by Secretary of State John Kerry and Russian Foreign Minister Sergey Lavrov and the subsequent Syrian regime offensive, there are many in Washington clamoring for firmer U.S. action—a so-called Plan B. However, President Obama and his National Security Council staff are faced with limited options. Among the four optionsthat may be under consideration are a no-fly-zone, safe zones, attacking the Syrian air force and arming the Syrian rebels with additional weaponry. But each option carries with it significant risk of escalation or blowback. While the United States has the capability to defeat Russian and Syrian regime air forces and air defenses, which is necessary to establish a no-fly zone or safe-zone, or to destroy the regime’s airpower, there are several risks from a legal and military standpoint. The legal problem comes from the fact that the United States is not technically at war with the Syria, nor is there a UN resolution authorizing American forces to operate inside that nation.